“The Gravensteins are almost ripe,” I emailed my mother. “Want some?" Still farming at age 80, my parents hadn’t had time to come to dinner for a long time. But they would drop everything and drive two hours for a bucket of Gravenstein apples. This broad green apple, often striped with red, is wonderfully tart, sweet, juicy, and aromatic. It ripens early, beginning in late July, to provide relief from the long hunger for fresh apples. The Gravenstein isn’t a keeper; its short stem often makes it fall, and its moist, crisp flesh bruises easily. But there are plenty of good ways to preserve this apple, bruised or not. I believe it makes the very best sauce, butter, pies, sweet cider, and hard cider. 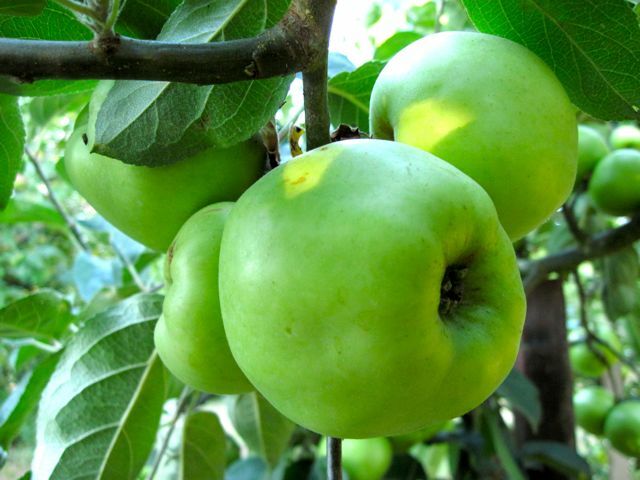 The Gravenstein originated in the 17th century in Denmark, where it is still well appreciated; in 2005, the Danish food minister declared it the national apple. Russian otter hunters planted it, along with other fruits, at Fort Ross on the northern California coast in 1820, and their orchard became the foundation of a thriving Sonoma County apple industry. Growing up in Santa Rosa, I ate little besides Gravensteins for a month every summer. Although the Gravenstein prefers a cool, coastal climate, it does grow elsewhere. In my flat, low-lying Willamette Valley orchard, I get a crop at least every other year. This year’s crop is big. The apples may not be as good as Sonoma County Gravensteins, but they are very, very good. If somebody offers you apples in mid-August or earlier, there’s a good chance they’ll be Gravensteins. If they start softening faster than you can eat them, here’s what to do: Peel, core, and slice them, and freeze them for pies and crisps. Or heat the pieces in a covered pot, and soon you’ll have applesauce with a heavenly fragrance and texture — with no mashing or puréeing. Do you hate peeling and coring apples? Then simply cut them into pieces before cooking them. Sieve out the skins and seeds, add sweet cider or brown sugar or both along with spices, and cook the purée uncovered until it becomes a thick apple butter, a fine treat to put away for winter breakfasts. If you’re lucky enough to have several boxes of Gravensteins, press them into cider yourself. (You can rent a crusher and press from a brew store.) It will be the best cider you’ve ever tasted, and it will ferment into an outstanding hard cider with no other apple varieties added. Before the cider ferments, if you like, boil some down into an amazing no-sugar-added syrup or jelly. If you are so unlucky as to lack a Gravenstein tree, or any friend with a Gravenstein tree, hope is not lost. Gather your nursery catalogs, and start figuring out where you’ll plant your own Gravenstein tree this coming winter.